A number of people reported the issue of not being able access their internet, by logging in to the WiFi network even after providing the correct credentials, although they were connected to the WiFi network signal. The reason being the login screen appears blank or empty and might probably give an impression that the page is stuck or still has to load. This issue will be mostly seen when connecting to public WiFi networks, such as a hotel WiFi or an office or any school network. While many might argue that this is an issue with the portal or the hosting or with the browser on the mobile, let me assure you that in most cases these are not the ones causing the hindrance. In fact the issue seems to be mostly with the Android phones having Android L 5.0 installed. Without further ado lets delve into the solution as I assume that most of you are browsing internet over your mobile network and would not want to waste your precious mobile data. Connect to your WiFi network and verify that the connection has been established and the connection is successful. Now usually, a notification is shown to the user asking him to sign into his network. 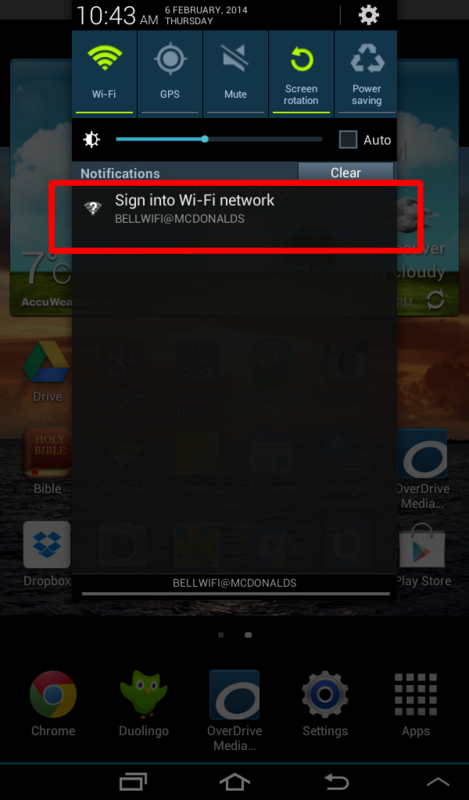 Open the notification and click on “Sign into Wi-Fi network”. On clicking on this, you are redirected to the login page where you have to enter your credentials. In most cases these are provided by the hotel or the office whose network you are able to connect. If the login screen is loaded perfectly, enter your credentials and click on Submit. In cases where the login page doesn’t load properly and is shown empty, click on the 3 dots icon seen on the top right and tap on “Use this network as is”. On doing this, the login screen disappears and you will probably re-directed to your home screen. By clicking on go, you would be re-directed to the WiFi login screen and this time the page would have loaded properly. Enter your credentials and you are good to go and leach up the internet connection, while saving your mobile data. Hope this solution has fixed your problem. Do comment below if in case you need any further assistance or you have any other easier fix or solution to this problem. Is a Software professional but is passionate about writing articles in-depth covering news about latest updates and also helping users solve Errors and Problems being faced in their smartphones. His daily driver is OnePlus One. Hey, I get a “sign-in to network” screen that is blank with a padlock (crossed through) in the middle and no ‘3 dots’ at the side. my menu button doesnt work and there is nothing to do on this page at all. Hi wilson, will look into this issue. Is it possible for you to post a screen shot for better understanding? Did not work, I’m still getting a blank page. It asked for a permission when it first came up. I mistakenly denied whatever permission it wanted. Is there anyway I can reverse my decision?